A Mobileye autonomous driving test vehicle, at the company's headquarters in Jerusalem, on May 15, 2018. Last week, Mobileye, the Intel-owned manufacturer of driver-assistance systems, announced it would compete in the race to create a fully driverless car, unveiling a fleet of prototype vehicles in Jerusalem that navigate city streets without the use of lasers or radars, which rivals have relied on heavily in tests. A Bloomberg Businessweek reporter had an early look at the cars last month, during which a camera-only vehicle performed well despite heavy, chaotic Jerusalem traffic. But at a press event in Mobileye's hometown last week, a car outfitted with television cameras from Israel's Channel 10, went straight through a red light near the company's garage after an otherwise uneventful ride. Nobody was hurt, and Channel 10's video seems to show a Mobileye safety driver monitoring the vehicle, but allowing the car to proceed without trying to stop it. Mobileye's CEO Amnon Shashua said wireless transmitters on cameras used by the television crew created electromagnetic interference, which disrupted signals from a transponder on the traffic light. Although the car's camera correctly identified the light as red, the car ignored that information and drove based on signals from the transponder, a mistake that has since been corrected, he said in an interview. "It was a very unique situation," he said, referring to the camera crew. "We'd never anticipated something like this." Shashua said Mobileye was also modifying the hardware designed to shield the car's computers from electromagnetic interference in order to prevent similar incidents in the future. Mobileye's Jerusalem fleet has continued to operate and the company hasn't received any complaints from automakers, Shashua said. 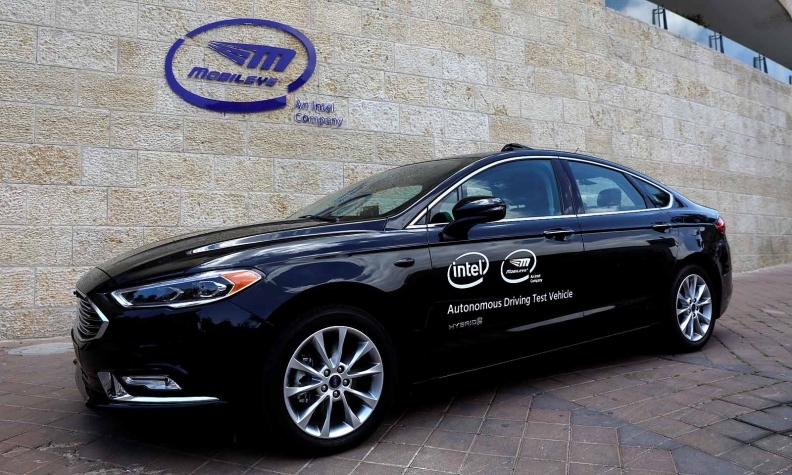 Intel bought the Israeli company for about $15 billion last year and has made its technology central to the U.S. chipmaker's autonomous vehicle strategy. Companies such as BMW and Fiat Chrysler Automobiles plan to use Mobileye's technology in their driverless cars. The current prototypes don't use lasers or radars, but Mobileye plans to add those sensors for redundancy once it has proven that its camera-only system works. But how long it will take Mobileye or any company to replace a significant number of conventional cars with driverless ones is an open question. Only one company, Alphabet's Waymo, which was spun out of the old Google autonomous car division in 2016, has tested cars on the roads without safety drivers. Meanwhile, Uber, once seen as Waymo's most formidable competitor, has suspended testing after one of its self-driving cars killed a pedestrian outside of Phoenix. Traffic signals have proven to be a particular source of embarrassment (not to mention a potential safety hazard) for self-driving vehicle companies. In late 2016, shortly after Uber began testing its cars in San Francisco, a driverless car was caught on camera running a red light. Uber blamed an inattentive safety driver. Waymo experienced a related incident two months ago, when a video posted on YouTube seemed to show one of its self-driving cars going through a red light after stopping to try to make a left turn. The company said the car's driver had taken control and gone through the light in order to complete the turn.